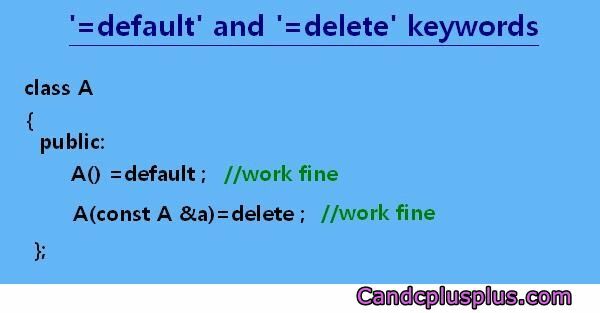 Two new keywords are added in C++11: =default =delete. These keywords help command the compiler to either generate a function or make the function noncallable in your program. These two keywords are helpful for easier specification of what the compiler should do with the functions defined with it. The two keywords are explained in detail below. The =default keyword commands the compiler to generate a synthesize version of certain function. For instance, if you do not want to define the default constructor explicitly, we can define the function as ‘=default’. The compiler will then generate the default constructor for us without any questions ask. Using =default only with functions that can be generated by the compiler is meaningful. Using it with programmer’s own defined functions or functions which the compiler cannot generate wouldn’t make any sense as such functions cannot or is not liable to be generated by the compiler. So, it can only be used with constructors, copy constructor and destructor. int get() =default; //error! definitely! Defining the get() function as =default is nonsensical, as the compiler has no information of what this function do and so it cannot generate the definition of the function. Hence, defining get() as =default is an error. The =delete keyword tells the compiler to make the function noncallable. In other words, defining the function as =delete is a way of telling the compiler to prohibit any call to that function. So, trying to call any function defined as =delete will give you an error. The default constructor is defined as =delete, so we cannot call it. Unlike the =default keyword, =delete can be also used with the function defined by the programmer besides those functions which the compiler could synthesize. Also note, functions defined as =delete can have its overloaded version. A program is provided below to take away all your confusion.